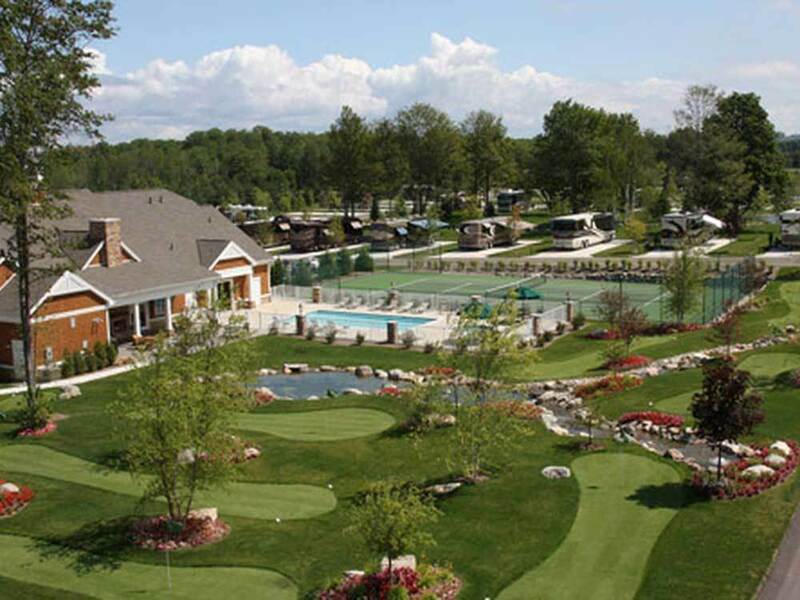 THE FINEST RV RESORT IN MICHIGAN! Great RV Park. Paved driveways and level concrete sites with a great clubhouse. Highly Recommend! Gorgeous first class resort Impeccably maintained landscape and facilities We are able to receive mail here Great location for Mackinac Island, upper peninsula, charlevoix, traverse wheelway, bay harbor Took the Kilwins kitchen chocolate tour Awesome Internet and cable PERFECTION! What a beautiful place. Very clean and well kept. Convenient to many attractions. Highly recommend. Spent 10 days at this facility. Awesome place to stay. Hated to leave, but we were headed to the UP for several weeks. Would definitely go back! My only observation is that picnic tables are not provided at each site. Then again, this is a luxury resort. You can always go to the clubhouse (open 24/7) and use their gas grills anytime you want. Great pool! Great Fitness Center! Great restrooms/shower facility with sauna! Clearly you pay for what you get and it was worth it. This has to be the nicest RV park in upper Michigan. It has a peaceful setting with water fountains, beautiful landscaping and is right across the street from the bike/walking path where you can head either to Charlevoix or Petoskey. And from the bike/walking path you can see Lake Michigan. The grounds are immaculately groomed. Each site is on a concrete pad with all amenities, including cable. The clubhouse is clean and offers many activities............billiards, movies, pool with whirlpool, 9 hole putting greens and a sauna in the restrooms. The staff are very friendly and helpful. The RVers are fun and so friendly. We have stayed there 3 different times in the last year, and will always plan to incorporate a visit or two every year from now on. Don't pass this park up. It is FABULOUS!! Beautiful RV Resort and conveniently located between Traverse City (Sleeping Bear Dunes) and Mackinaw City and Mackinac Island. Great shopping in Charlevoix is just down the road a bit. Excellent staff. Club house was exceptional and open for coffee and sweet rolls in the mornings.